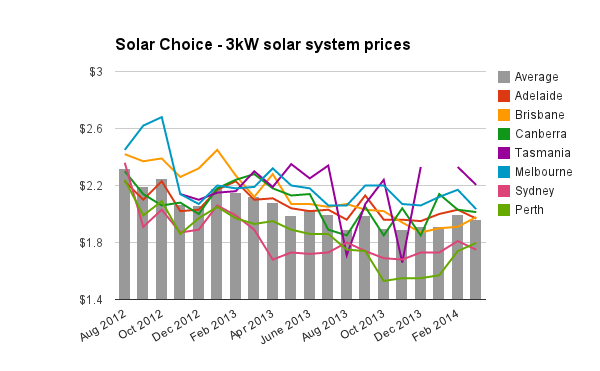 Between February and March, average 1.5kW and 2kW solar PV system prices continued their steady rise in all cities included in the PV Price Index except for Adelaide, while pricing for 3kW, 4kW, 5kW and 10kW prices remained steady or fell across the board. All prices in the table below are inclusive of the federal STC incentive which installers ordinarily bundle into final system prices. 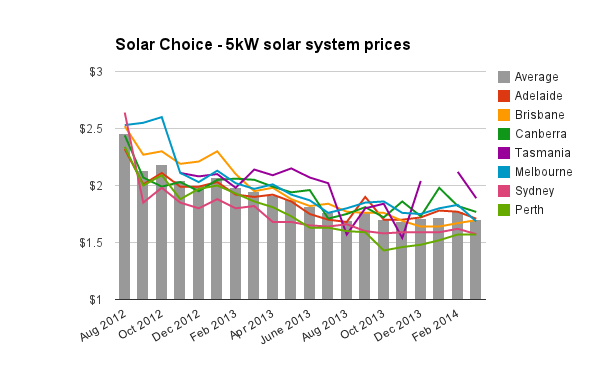 STCs accounted for a price reduction of approximately 71c/W for Zone 3 cities (Sydney, Canberra, Perth, Adelaide, and Brisbane), and around 65c/W for Melbourne & Tasmania. The table below contains the brands of inverters and solar modules used in installations as listed by installers. ‘Premium’ options are not included. 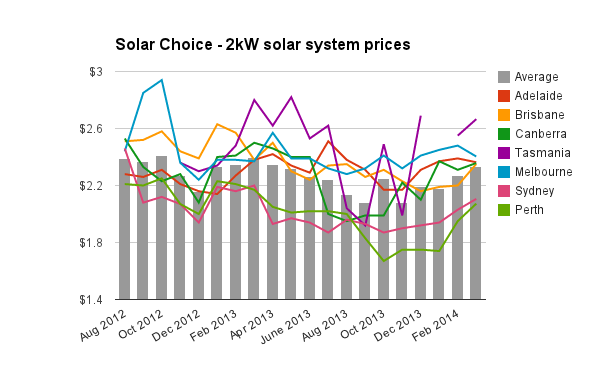 Tables and charts included in this article were compiled using data from Solar Choice’s installer network database, which contains regularly-updated pricing and product details from over 125 solar installation companies across Australia. Prices do not ordinarily incorporate meter installation fees or additional costs for difficult installations. 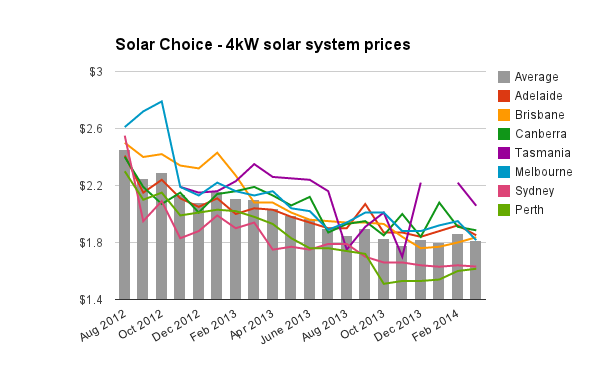 The discount available to Solar Choice customers is also excluded from calculations, as are prices for ‘premium’ installer offerings. 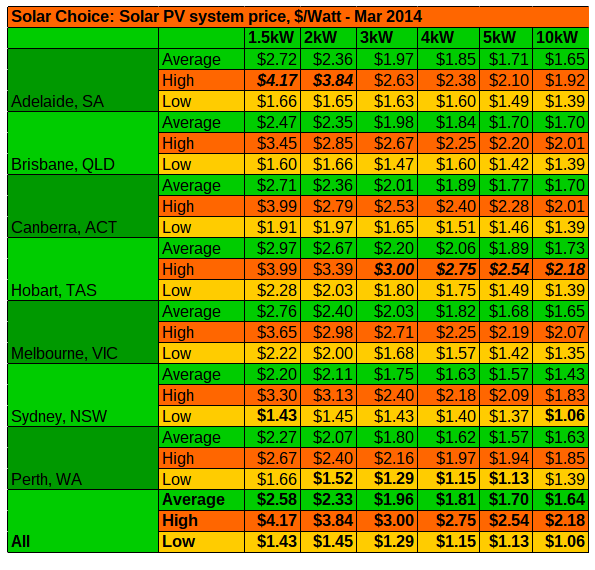 Average pricing figures for all of Australia are not weighted. 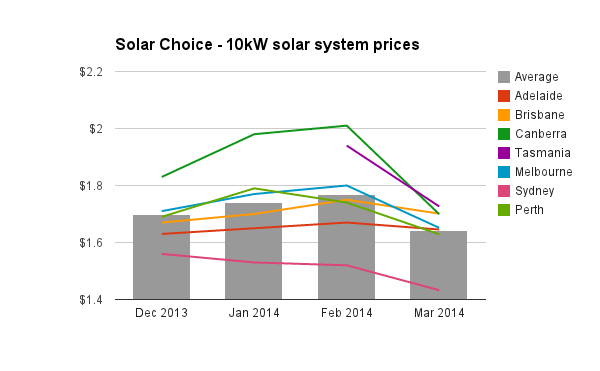 Solar Choice is a solar PV installation and advice service based in Sydney, NSW, providing free Solar Quote Comparisons for residential solar customers Australia-wide. Solar Choice’s commercial wing, Solar Choice Commercial, manages tenders for medium- to large-scale solar projects for a wide range of clients. 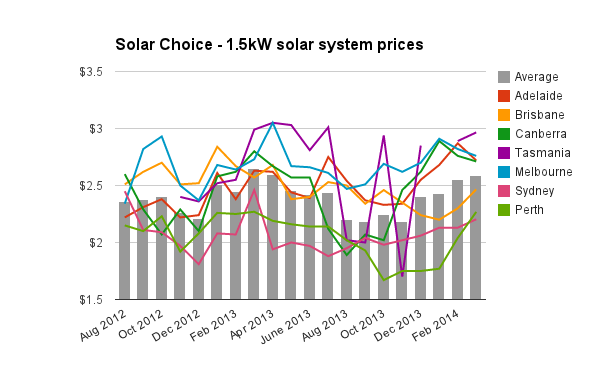 Solar Choice also develops large-scale and utility-scale solar projects of its own.